The PCCP uses the terms land-cover type, community, and constituent habitat to classify and describe the biological and land use setting of the Plan Area. Land-cover type is the dominant feature of the land surface discernible from aerial photographs and defined by vegetation, water, or human uses and serves as the basic mapping unit. 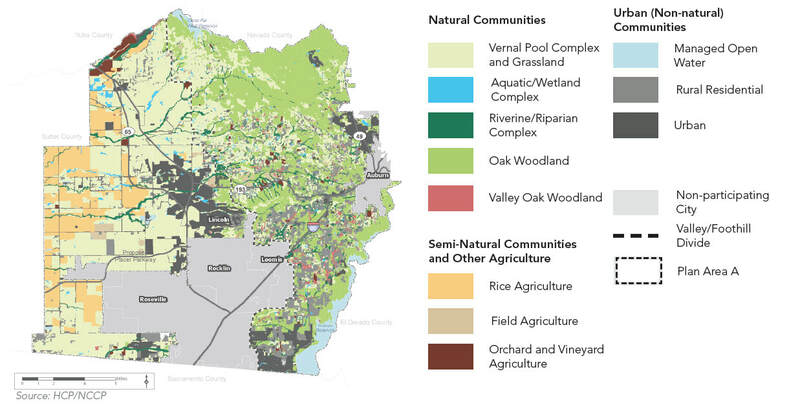 Land-cover types are modeled after the California Wildlife Habitat Relationship system adapted to better describe the mosaic of agricultural and urban uses in the Plan Area. Constituent habitats are wetlands or other patches of habitat that are not directly mapped and their presence is inferred by association with land-cover types. The mapping reflects the environmental setting prevailing during the PCCP planning period and accordingly, the Wildlife Agencies have set 2011 as the baseline year for evaluating covered effects. The mapping is a compilation of Placer County data and air photo interpretation offering sufficient accuracy for regional scale planning.